It's easy to say that Mould's 1989 debut is a post-Hüsker Dü album, but the story of Workbook is a more complicated one than that, and 25 years later it still plays like a story worth hearing. When Hüsker Dü split in 1988, there was no going back. The competition between Bob Mould and Grant Hart had become opposition. Hart was dealing with drug addiction. Bassist Greg Norton had all but checked out, and Mould was not just ready to move on, he severed ties. It was a definitive and final split for the band. So when Mould recorded his first solo record, Workbook, for Virgin Records, he didn't want his former band mentioned in the promo material. He wanted a fresh start. 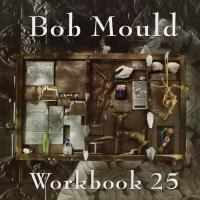 And now, as we Omnivore Recordings celebrates the album's silver anniversary with Workbook 25, it's still thrilling to go back to this first step in Bob Mould's solo career. The sound is a drastic shift from his former band, trading white-out distortion for rippling, clean guitar effects and 12-string acoustic guitar. The rhythm section, made of former Pere Ube players Tony Maimone and Anton Fier, too the shuffling, chaotic fury of Greg Norton and Grant Hart and expanded it into airtight yet epic percussion. But in studying Workbook 25, it becomes clear that this isn't the clean break it first seems, despite the new approach. Professionally Bob Mould had left Hüsker Dü behind, but Workbook is the continuing story of Bob Mould the musician, not an introduction to a new story. Though it is hard to consider that way of thinking when you hear the soft instrumental opener "Sunspots". It's cascading layers of guitar are on another planet from the sounds you'd have heard on "Chartered Trips" or "I Apologize". But it does set up the album nicely, leading into the jangling guitars and spacious hooks of "Wishing Well". This song complicates the sound a bit, or its connection to the past. Though the new mix has Mould's barking vocals right up front, cleared out from any sonic distortion, the song does turn to a blistering guitar solo in its second half, bringing that distortion in to drive home Mould's unique fury once more. "Heartbreak a Stranger" feels like a bigger departure, riding a clean, tumbling hook out into empty space. Mould sings of "all the enemies left behind and friends that time forgot" but the expansive feel of the song assures you he's talking about something far bigger than his last band. In fact, the thing about Workbook that is most fascinating is how it deals with space, how it seems to scrape out huge areas by inverting the elements of Hüsker Dü. That band, also a trio, filled space with its sound. It was big, but its largeness was dense. On Workbook, Mould, Fier, and Maimone leave craters around these songs, they have room around them to breath, to shake and shudder, to echo around you instead of ring in your ears. The lead single "See a Little Light" is the perfect example of this. It's a surprisingly sweet sound from Mould, with the guitar-work reminiscent of Celtic-influence folk. But the hook chorus is towering and catchy, exactly the kind of thing Mould had been tightening in his repertoire for years, albeit with different elements. Album standout "Poison Years" is a more complicated version of the furious catchiness of these seemingly more somber tune. It starts with a watery riff that calls to mind (and predates) Nirvana's "Come As You Are", but its more are far from predictable from there. Mould screams until his voice fades, melting in effects. This rise and fall continues until halfway through the song shifts to a fully muscled power-pop gem, with the album's most memorable chorus and an onslaught of thick guitars. The song seems to open up the album as a whole, as it leads to the wandering but brilliant "Brasilia Crossed With Trenton" and the verse-after-verse-after-verse composition of "Compositions for the Young and Old. The album closes with "Whichever Way the Wind Blows", which sounds nothing like these other songs. The distorted guitars aren't laid over these sweet tunes, they take it over, and the song gets obliterated in a hail of drums, bass, guitar, and Mould's screaming vocals. It feels like a final way to let loose on this album, and if the volume suggests his former band, the huge composition and complicated mixing of the song suggest a leap forward. All through the album, Mould's singing pulls on words and phrases stretching them to their limit. Given space in the mix to really sing, rather than scream over instruments, Mould takes full advantage and you can feel him trying to stretch everything, even single words, to their limit. The idea of stretching fits Workbook as it's an album that doesn't quite move on so much as it shoulders the past on its way to the future. It's an album in search on purity, clarity, something Mould feels distanced from. On "Compositions for the Young and Old" he's sure that "no one trusts anyone's intentions anymore" and now "everything is so expensive and complicated." The song ends with a prediction for rain, and Mould's plan to ride it out is to stay in, "make peanut butter sandwiches and cry." This combination of isolation and riding out the storm runs throughout Workbook. In the wake of change, Mould seeks simple sustenance, personal expression of emotion, and clarity of intention. As much as Mould is starting over on this album, it's important to note the memory box on the album's cover, artifacts from the past that come along with these trailblazing new songs. Workbook 25 has extras that are both excellent and instructive to this shift in Mould's musical life. B-side "All Those People Know" is a hard charging rock tune, out of step with Workbook but great in its own right. Also included here is a live show from 1989 in Chicago. It's an impressive performance. Mould cuts loose on guitar and vocals, shredding through these songs without muddling them. The whole band is tight and in top form, proving that the album is no mere studio constructing, it's a living, breathing sound. Included in the set is "If You're True", a song that -- according to Mould's memoir, See a Little Light -- makes the most obvious reference to Hüsker Dü's split. It's a fiery performance, but it's also important to note that these two songs, the ones that most recall his old band, are not on the album proper. Even the Hüsker Dü songs Mould plays in the show are done acoustically, so "Makes No Sense At All" and "Celebrated Summer" are moments for him to assume ownership over his songs. It's a connection between him and the crowd as they sing the words along, not between the crowd and their memory of another band. It's clear in these moments, moments outside Workbook the album, that show Bob Mould may have been moving on professionally, but musically he was just growing here. Maybe Workbook was a total shift, or maybe it was just an inversion of expectations, a next logical step in Mould's sound. How else to explain the clear lines connecting this and the darker, more distorted follow-up Black Sheets of Rain? It's easy to say this is a post-Hüsker Dü album, but the story of Workbook is a more complicated one than that, and 25 years later it still plays like a story worth hearing.